The Chase Sapphire Reserve card sure has a lot going for it, but what if this $450 annual fee rewards card just isn't ... elite enough for you? What is a black card? A black card is a type of extremely exclusive credit card that is almost solely reserved for the ultra-wealthy. Typically, the cards are available on an invitation-only basis. Even the look of the cards indicates they are special, says Beverly Harzog, a credit card expert and author of "The Debt Escape Plan." "Black cards do have a sleek and sophisticated look that gives a cardholder an 'exclusive' kind of feeling when they hand over the card for a purchase," she says. Personal shopping assistance at expensive stores. Exceptional travel benefits, such as late checkouts, upgrades on seats and airport club access. The ability to get reservations at restaurants that are impossible for mere mortals to get. CARD SEARCH: Looking for travel rewards available to everyone? Let Bankrate help. "There are many fantastic benefits with these cards," Harzog says. "But they also come with high annual fees compared to standard credit cards." One more thing: You probably can't get one. "You just aren't going to find an application for a black card laying around," says Travis Tuss, senior vice president of sales and marketing for Zoot Enterprises, which provides credit solutions to large financial institutions. For many of these cards, you must be invited into the club, and that's not going to happen unless the issuer sees you already spend $25,000 to $100,000 annually on one of their less elite products, Tuss says. Part of the allure surrounding the high high-end cards is the mystery that surrounds them. There's little in the way of marketing campaigns and the issuers are loathe to offer details. American Express Centurion Card. This very exclusive card has an initiation fee of $7,500 and an annual fee of $2,500. When people talk about "the black card," they typically are referring to this famous card. American Express is notoriously tight-lipped about the card. But media reports have suggested that you need to spend at least $250,000 annually on an American Express card before the company will consider inviting you to upgrade to Centurion Card status. The most useful perk, according to The Points Guy, is the concierge service, which can get you a seat, for example, at that restaurant everyone has been waiting months to get a reservation at. "So far, the service has been everything I expected and more -- in the instances where I've needed to contact the concierge, I've been impressed with the service and the outcomes the concierge has been able to report back to me with," The Points Guy writes. MasterCard Black Card. Made of stainless steel, this card has an annual fee of $495. But perhaps it is some consolation to members that after paying that hefty toll, they will get to read the members-only Luxury Magazine. If the Black Card is not prestigious enough for you, try the 24-karat gold-plated Gold Card, which has an annual membership fee of $995. 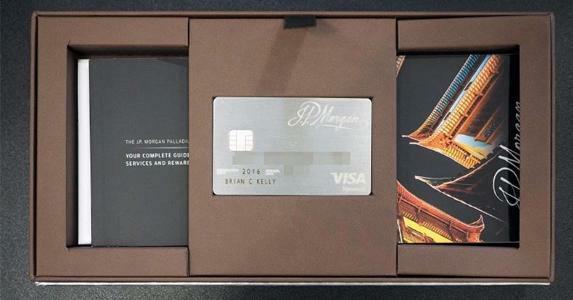 JP Morgan Palladium Card. This card is available to select private banking clients, who may have to have millions of dollars managed by Chase in order to qualify. This card, which charges a $595 annual fee, also offers 35,000 bonus points when you spend $100,000 in a year. For some, a black card is aspirational. For those that can actually get their hands on one, it may be a confirmation that they've made it. Income, for example, is a big factor in who gets an invite, Tuss says. But the cards also may serve as a status symbol. "These are truly the cards for people who have an ego problem and they want to get it stroked," says John Ulzheimer, a credit expert formerly with credit companies FICO and Equifax. Ulzheimer questions whether a typical spender would get enough out of these cards to justify the annual fees. "For most people, these elite cards are completely unnecessary," Ulzheimer says. CARD SEARCH: Find a rewards credit card that's right for you. If you're shopping for a new rewards credit card, you should look to one that can get you rewards for the type of spending you do. So if you don't fly much, you probably shouldn't apply for a card that offers better rewards for travel-related expenditures. You'll also want to make sure you can earn back at least as much in rewards as you have to spend on an annual fee. A $495 annual fee might not seem like a big price to pay for someone who uses the airport lounges and takes advantage of bonus travel rewards. But for others, those perks would be next to useless. Ulzheimer says a card that provides cash back for spending might be the best fit for most people. "Cash has no blackout dates, and everybody understands the value of a dollar," he says.